So you have finally decided which type of fence to install, now the question is how will you know that if it is installed correctly? The first thing you need to pay attention to is how the post are driven or set into the ground. A 7’6″ post should be in the ground 2’6″ in the ground leaving about 5 foot sticking up. 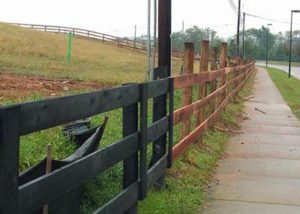 Most fence is run about 58″ to 60″ to the top of the board. If you see your contractor leaving a lot of posts sticking up past 6′ out of the ground then one of 2 things is happening. They have hit rock and need to pull the post and dig out the rock. The ground is really hard, like in the middle of a summer drought, and they are not taking the time to auger a hole and water it. Both of these situations will cause the fence to be weak and most importantly will decrease the life of your fence because it will simply fall over. Also these weak posts will start to loosen up when the ground finally does get some moisture, this will cause the posts to weave or lean over one way or the other. This makes a fence look about 30 years old and makes for a weak fence. If you have a board fence and the posts start to lean this will cause the boards to warp very fast. As you can tell in this picture the fence is ready to fall over. When you see a few posts all in a row like this that are falling over and the rest of the fence looks good this means that there is rock here and whom ever installed it did not drill out the rock and concrete the holes. The installation of the post is even more important when you are using polymer. The terminations (or any where the polymer ends at) needs to be concreted and braced. The terminations in polymer are the most important aspect of the fence installation, simply because the entire pressure of the fence is really held by the posts in the termination. If the end posts are not installed, concreted and braced right they will pull over from the tension of the polymer. The corners also need to be concreted but to a lesser extent since they do not have nearly the pressure the terminations have. 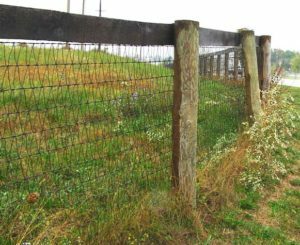 Wire fence is also very important to install correctly, anywhere the fence ends or curves needs to have 9 foot tall gate posts and either be concreted, braced or both. As I have mentioned before wire can be curved to allow a safer field or paddock for your horses. 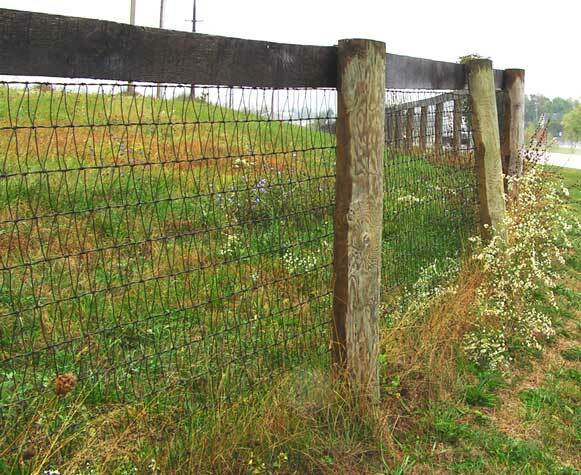 Square corners are something everyone expects from wire fence, but that is not the case at all. 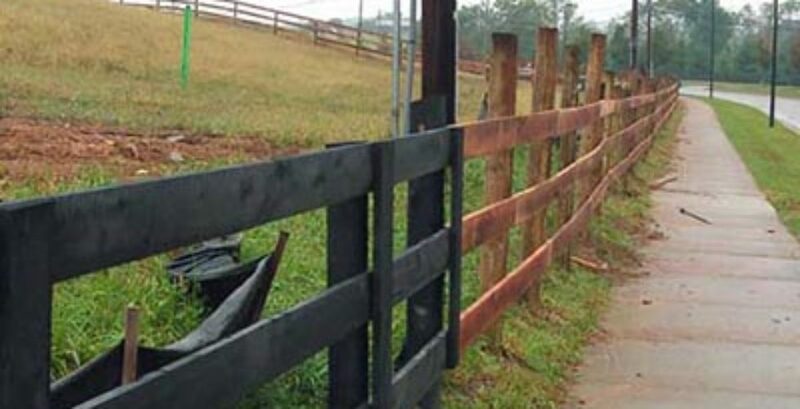 We can make your wire curve and look just like a board fence curve. 1. Curves in paddocks are safer since there are no square corners for a horse to get trapped in by another horse and kicked. 2. Curves make it much easier to mow and bush hog around since they flow with the turning radius of the tractor. 3. Curves also just look much better than square or angled corners. Here is a good example of what happens when someone tries to curve wire unsuccessfully. You can see the pressure of the wire has almost pulled the fence over. You can see that the wire is not really that tight anyway and it still pulled the post over. This was caused by not making the corner posts strong enough to withstand the pressure of the wire.